Big Agnes Van Camp SL2 Tent. A superlight, easy to pitch tent that does it all. 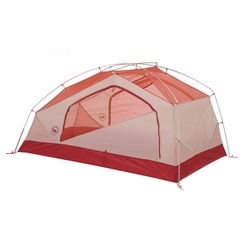 With a roomy, box shape that offers tons of head room and a colorful mesh/nylon design, steep walls, and two doors/two vestibules, the Van Camp SL tents will keep you just as happy on trail as they will at any festival or campground.